(BPT) – Many Americans are avid sports fans, and technology has made it easier than ever for them to enjoy their favorite sporting events in the comfort of their own home. From annual events like January’s Big Game and month-long college basketball tournaments, to international competitions that draw athletes and audiences from around the world, Americans love to gather together to celebrate their favorite sporting events. * Sports apps. Leagues and sporting events of virtually every kind have free apps you can use to keep up on what’s happening with your favorite teams and athletes. You can even download an app with news and schedules for the 2016 summer games, a searchable database of medalists, records and more. Use it to host a party under a theme tied to a specific game and help everyone keep track of the latest. * Portable projector. 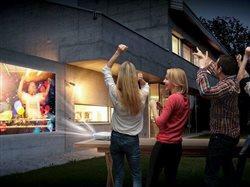 You can take advantage of good weather by taking the viewing party outdoors with a portable projector. The lightweight “Minibeam” LED projector from LG, for example, is easily transportable, weighing only 1.43 pounds with an embedded battery that provides up to 2.5 hours of run time, eliminating the need to plug in every time you use the device. Bluetooth connectivity means it can connect and share content between Bluetooth-enabled devices while delivering high-definition picture quality that’s clear and bright with sharp contrast and rich blacks. It can also stream content directly from premium content providers like Netflix, YouTube and Hulu, among others. * Wireless speakers. Pick up on every cheer and capture the emotion in every winner’s voice when you use wireless speakers arranged to optimize sound. Wireless speakers like Music Flow can connect to your TV, surround sound system and even your mobile devices to ensure no one misses a moment of their favorite sporting events. * Fan Fridge. Let your guests help themselves! Many LG refrigerators feature a “door-in-door” compartment, which makes it easier for your fellow fans to quickly and easily access must-have snacks stored in the interior door compartment. Just stock the compartment with their favorites, and they can access the food and drink they want with a touch of a button — and without ever having to open the entire refrigerator. Not only is this convenient, but opening just this section of the fridge will keep cold air in to help food stay fresher for longer – most useful during those hot summer days to prevent cold air escaping from where it matters most. * A smart cooler. If you’ve decided to move your sports celebration outdoors, you’ll need a way to keep beverages and snacks cool and fresh. A smart cooler can do the trick, and some of them will even charge your cell phone. From smart coolers that are equipped with a solar panel that can charge small mobile devices, to ones that have removable blenders and built-in Bluetooth speakers, or interior lights that make night-game snacking a cinch, today’s smart coolers are a far cry from the Styrofoam boxes of your childhood! To learn more about electronics and appliances that can help you score a win during game-day entertaining, visit www.LG.com.